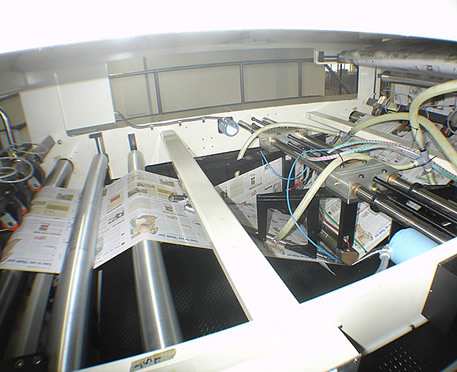 Broadsheet newspapers can produce four page wide centerfold using Innotech’s Panorama Gatefold System, offering advertisers an attractive opportunity. Instead of slitting the double wide web, it is shifted sideways and full page wide gatefolds are made on each edge to produce panorama centerfold or special section that will open up to provide a wide display area. It is possible to make the gatefold on one or both edges and the gatefolds can be folded in or out as shown below. It is also possible to use the Panorama Gatefold System to produce an additional center spread or a pull out section. Additionally, it is also possible to make smaller gatefolds or coupon folds at one or both edges for special promotions. Innotech System can be adapted to fit in new or old presses from all manufacturers. The folds in Panorama gatefold System are made by INNOFORMER™ the geometric air bar plow, that enable running at high speeds without the problem associated with rotary plows.